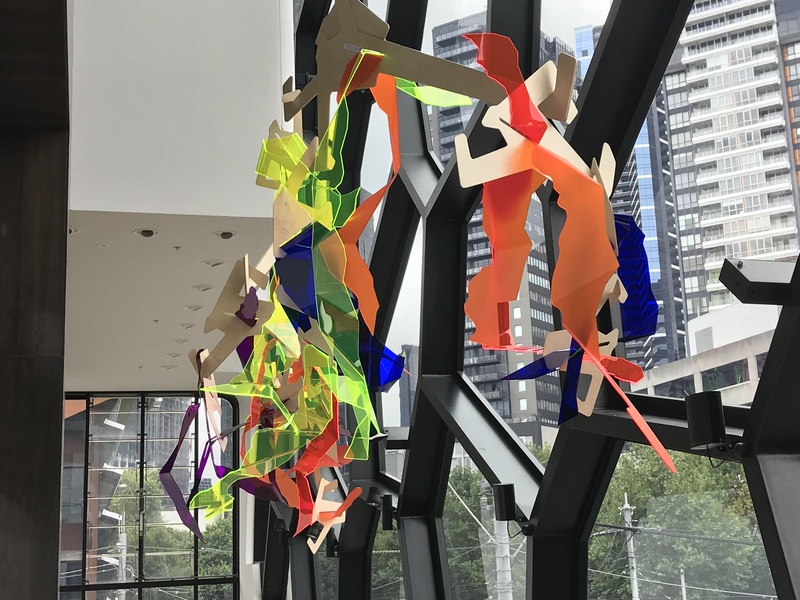 Until June 2018, you can view Anne-Marie May's stunning artwork, Hook Me Up (synaesthesia) hanging in Melbourne Recital Centre's grand staircase. Made by heating and stretching acrylic to yield a range of colour harmonies, this ambitious, multi-part sculpture absorbs and projects light, and creates shadows that animate the surrounding space. At a large-scale, and suspended to introduce subtle movement, its organic, overlapping forms change as you walk through the Centre. It appears dense and solid from one vantage point, but open and transparent from another. This sculpture belongs to the series Hook Me Up, a playful reference to the hook system devised to build them. Adapting an idea from a children’s game — a barrel of monkeys whose arms interlink to make a chain — May uses hooks to connect all the parts. The hooked curvy acrylic sheets, aided by gravity, lock all the components together. Hook Me Up was first exhibited at Murray White Room in 2015. Related works include the major commission RGB (Mobile), 2013—14, included in Melbourne Now and acquired by the National Gallery of Victoria, and Hema Spectrum, 2015, currently installed in the biological sciences building at Monash University. A long-standing interest in architecture and craft informs May’s passion for process and production — making and materials are central to her art. The artist works with materials in an intuitive way to explore spatial, perceptual and chromatic relationships. Materials as diverse as bronze, felt and transparent acrylic inspire her projects. Anne-Marie May’s sculpture lies in the continuum between geometry and gesture, transparency and solidity, void and mass. The artist’s work is held in numerous public collections, including the National Gallery of Australia, National Gallery of Victoria, Art Gallery of Western Australia, Museum of Contemporary Art Australia, Geelong Art Gallery, Fremantle Art Centre, and Heide Museum of Modern Art, The Chartwell Collection, and the Ten Cubed Collection. Discover what's hiding in the walls of Elisabeth Murdoch Hall.